ghost rider – Lizzy Acker! 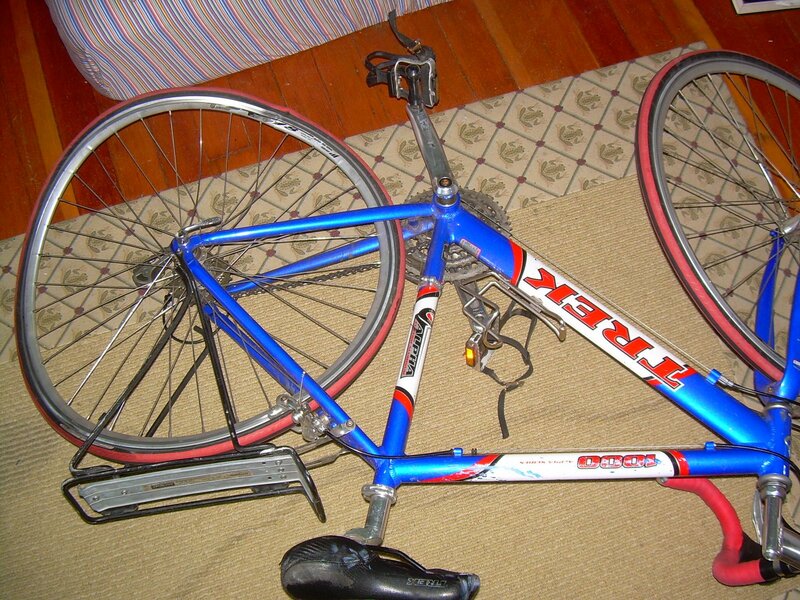 i have to say, moving on to a new bike because your last bike was smashed by a car after 6 years of faithful service is really the only way to go. while talking to my dad on the phone i decided that my bike is like a secret service agent who took a terrorist bullet for the president. sure it’s dead but it’s HONORABLY dead. 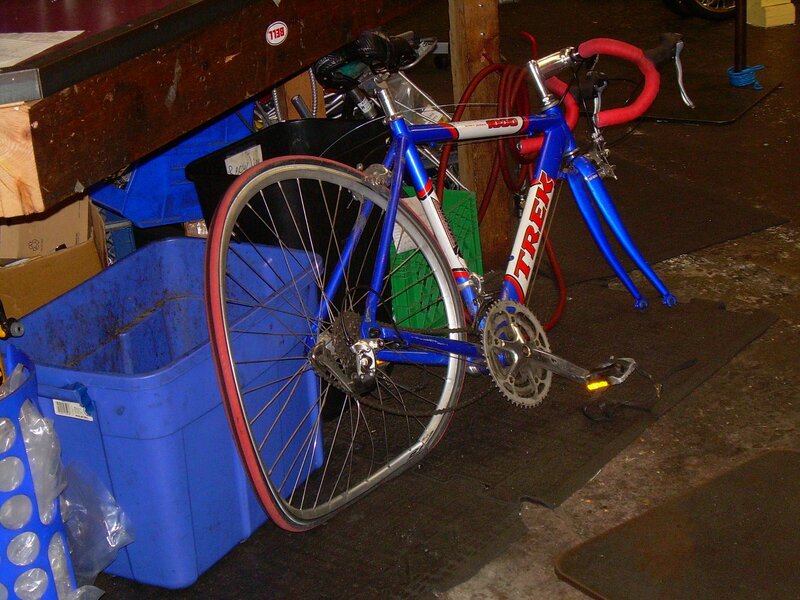 much more honorably anyway than my old old bike, jasper, which was stolen from outside of corvallis high school. you think i’m irresponsible now? you should have met me when i was 18. jasper was taken on his SECOND consecutive night unlocked in the outdoor bike area. anyway, after saying goodbye to the strangely nameless red, white and blue america bike that i got for high school graduation, i walked,wheel in hand, down to valencia street. i was planning on going to the cool bike shop and maybe even buying a cool looking bike, a seafoam bianci maybe, that would get me a little mission district street cred. but that bike shop was closed for another half an hour. so i figured i would just go LOOK at the much less cool bike shop’s trek selection. the cool shop doesn’t carry trek. one thing, of course, led to another and when the super cute bike shop guy looked at me with his insane blue eyes and suggested that the trek pilot 2.1 would “blow my mind,” i made the mistake of taking a loaner helmet and going for a test ride. he was so so right. he gave me another bike to try that cost about the same, which was A LOT for me even on sale and also a lot more than my old bike, but it wasn’t even close. no, the trek was the nicest thing i have ever ridden ever. 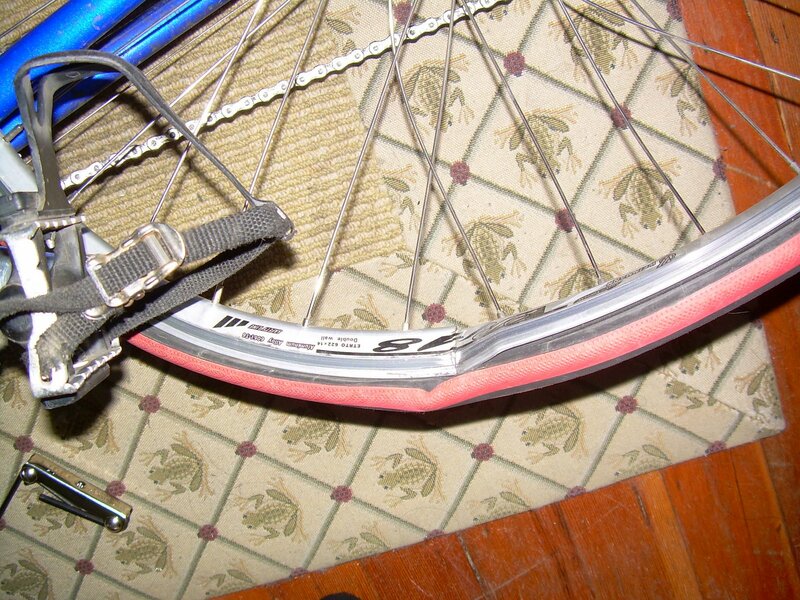 it was like a no-friction science experiment on the streets of the mission. i sort of wanted to cry. i left the store and tried to reason with myself. soon i realized that all my reasoning was making me think that i needed the bike. i called my guidance counselors. they seemed all for it. after all it was about $350 cheaper then usual. and i’m going to buy a bike right? 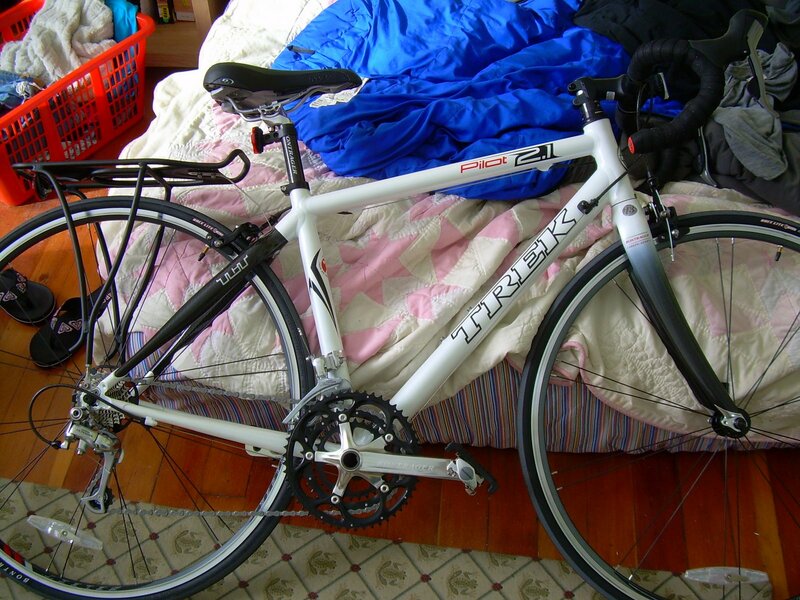 so why not spend like $200 extra and get the sweetest bike of all time ever? as you can see, the bike is white like ghost. an amazing ghost. a fast ghost. it is also way too nice to sit with the other house bikes up against the banister. it has some carbon parts for crying out loud. it is the most expensive thing i have ever bought in my own. so far the only appropriate place for it is my bed. the last thing about my bike is, now that i am in the grown-up league of bike owners, i have clip-less pedals and the shoes that go with them. this has added a whole new level of terror to bike riding. but i am going to spend all night practicing up against a wall. obviously: i’m so glad i didn’t go for a cool seafoam bianci. who wants to be cool? i’m fine with being fastest person on the planet, thank you very much.